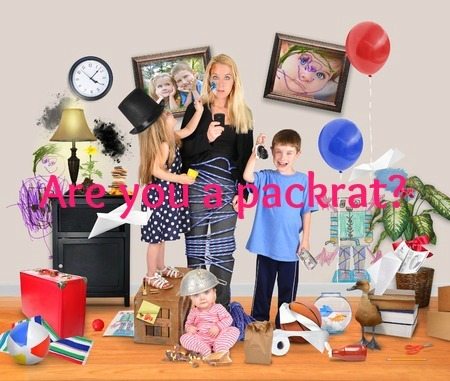 Debt Free, Cashed Up and Laughing - The Cheapskates way to living the good life: Are You a Pack Rat? 1. Hobbies - equipment and papers, partially completed projects. 2. Clubs and organizations - Scouts, Brownies, P&C, CWA, CFA, SES and so on. 3. Holidays - souvenirs, brochures, itinerary, matchbooks. 4. Gifts - all those lovely little souvenirs family and friends give you as mementoes of their holidays, the wonderful artwork that comes home from school or kinder everyday etc. 5. Inheritance - no need to say more. 6. Breakage and Loss - the cup with the broken handle, the button your found under the chair etc. 9. General paper - junk mail, school newsletters, church bulletins etc. 11 Religion - it's hard to throw away religious stuff, isn't it? 12 Home decorating - old pictures, old wall papers, old ornaments, soft furnishings, old paint etc. Firstly, don't confuse collecting with cluttering or collections with clutter. There is a distinct difference. Collectors are usually much more restrained, know exactly what they are collecting and collect only it, and are much more organized than the average packrat. Collectors are selective, packrat keep anything and everything. To deal with clutter successfully, you will need to decide whether you are a collector or a packrat. If you are a collector, find ways to display or store your collection safely, weed out the junk and get rid of it. If you are a packrat it's not so easy. You will probably have years and years of ingrained habits to overcome. Start by sorting (I know that its hard) into groups - use, save, throw out, sell, give away. Neatly put away the 'use' items, store the 'save' items, immediately get rid of the 'throw out' items - don't even think that they may come in handy, and take the 'give aways' to the Salvos straight away. Now, I don't expect that this will happen immediately, and it may take more than one session. Be diligent, follow the steps, your clutter will disappear and in its place, you'll find a collection.